In the late 1790s General Benjamin Whiteman built near this site one of the first log cabins in Alpha, the first settlement in what would become Beavercreek Township of Greene County. The cabin, later owned by Whiteman's father-in-law, Owen Davis, and leased for use as a tavern to Peter Borders, became the first courthouse of Greene County. Twenty-five feet square, it had one room below and a chamber above, serving as the family sleeping quarters. A small ladder through a hole in the ceiling reached the upper level. The building was constructed of burr oak logs with a roof made of clapboards held in place by long poles laid across them. Considered to be one of the finest houses in that part of the county, the cabin had one door, one window, and a huge fireplace with an outside chimney built of sticks, stones, and clay. cabin, was one of the first three associate judges. 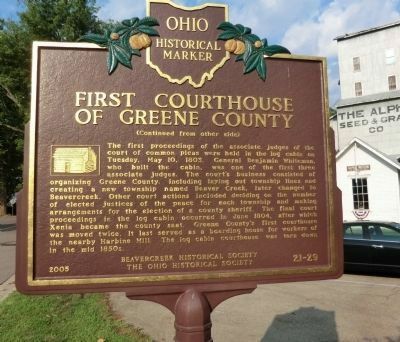 The court's business consisted of organizing Greene County, including laying out township lines and creating a new township named Beaver Creek, later changed to Beavercreek. Other court actions included deciding on the number of elected justices of the peace for each township and making arrangements for the election of a county sheriff. The final court proceedings in the log cabin occurred in June 1804, after which Xenia became the county seat. 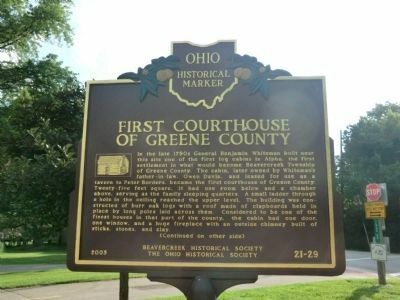 Greene County's first courthouse was moved twice. 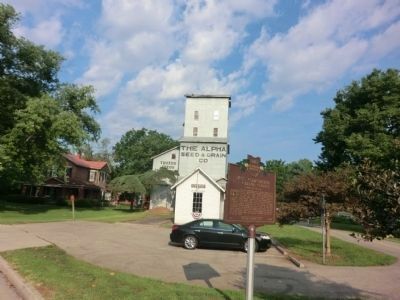 It last served as a boarding house for workers of the nearby Harbine Mill. The log cabin courthouse was torn down in the mid 1850s. Location. 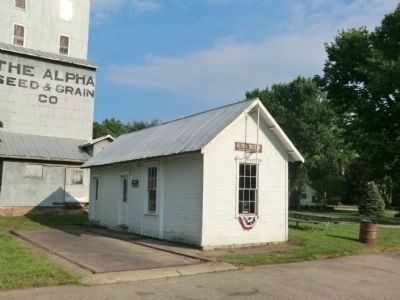 39° 42.587′ N, 84° 1.415′ W. Marker is in Alpha, Ohio, in Greene County. Marker is at the intersection of Alpha Road and Maple Drive, on the left when traveling north on Alpha Road. Touch for map. Marker is at or near this postal address: 751 Alpha Road, Alpha OH 45301, United States of America. Touch for directions. (approx. ¾ mile away); William Maxwell (approx. 2.1 miles away); Beavercreek Veterans Memorial #1 (approx. 3 miles away); Beavercreek Veterans Memorial #2 (approx. 3 miles away); Beavercreek Veterans Memorial #3 (approx. 3 miles away); Beavercreek Veterans Memorial #4 (approx. 3 miles away); Watervliet Shaker Community (approx. 4.3 miles away); The Sexton Point (approx. 4.8 miles away). More. Search the internet for First Courthouse of Greene County. Credits. This page was last revised on June 16, 2016. This page originally submitted on August 14, 2013, by Don Morfe of Baltimore, Maryland. This page has been viewed 319 times since then and 7 times this year. Photos: 1, 2, 3, 4. submitted on August 14, 2013, by Don Morfe of Baltimore, Maryland. • Al Wolf was the editor who published this page.